February is all about passion and love. But did you know that you can eat food for more passion? I didn’t know either until I was doing a class on that very topic. Here is what I learned about food for more passion, and a short video, too! Let’s first define the chakra system as much of what I am about to say is based on eating the colors associated with that chakra. The body is a bundle of energy. In yoga, and other Indian religions, the chakras are considered our life-force and centers of energy. There are usually 7 of them, although I have also seen 12 as in the energy work I do called The Path To Heal. 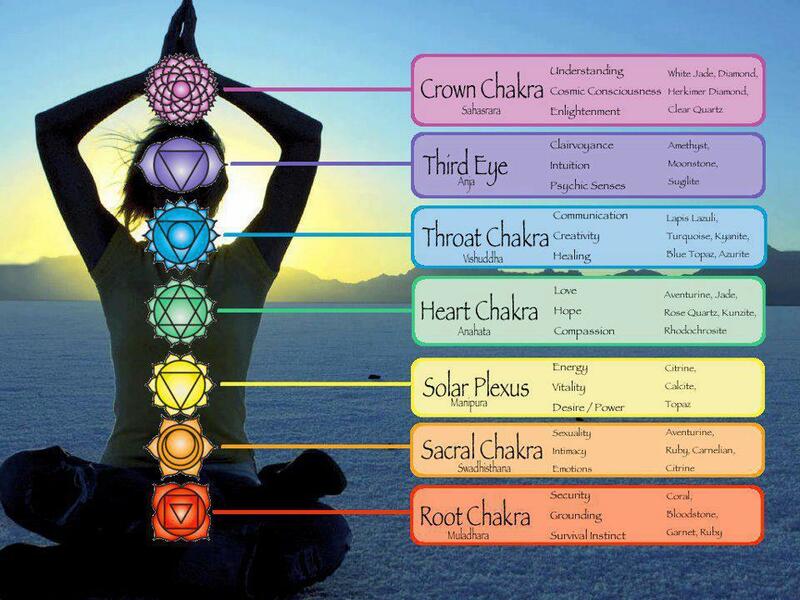 As you can see on the right, each energy system or chakra has a different color and location. For increasing passion, we need to open up both the heart chakra and the sacral/ sexual chakras. Passion by definition is a “strong feeling of enthusiasm or excitement about doing something or for something”. It is hard to have passion when your heart and sacral chakras are closed. The heart chakra is about love, relationships, balance and peace. When we open our hearts, we open up to giving and receiving love. The color associated with this chakra is green (it is not red like the Valentine’s Day holiday would lead you to believe!) This means, adding green vegetables and green foods would be highly beneficial to feeling more love. From a physical standpoint, I would agree that adding more green vegetables does help with energy and the natural magnesium and calcium also helps the heart beat better. Those are two of the electrolytes the body needs. When we are stressed, we use more magnesium and then the heart can also beat erratically as a result. The dark leafy green vegetables can naturally balance the rhythm with their mineral content. Magnesium is also calming to the muscles and helps them relax. When stressed, we get muscle tension usually in our necks and also during exercise. The dark green vegetables help with recovery as a result mainly from this mineral richness. Some of the green vegetables include kale, spinach, broccoli, cabbage, avocado, pumpkin seeds and any lettuces that are green. The sacral chakra is all about sexual energy. Not just the physical, but sensuality, creativity, desire and pleasure. The color associated with this chakra is orange. So eating vegetables and fruits of this color would be helpful to open the sacral chakra. These include oranges, mangos, pumpkin and butternut squashes, and sweet potatoes to name a few. When you put these two together, the heart and sacral chakra energies together, that is when you create passion. You love what you do. You love who you are with. You create from the heart with creativity, flow and playfulness. You are also curious, sensual, caring, loving and playful. This can be in both business and in relationships including intimate ones. You can put some meals together that can create that passion with foods that include both green and orange colors. Farm fresh eggs (the yolk will be bright orange!) and create an omelet with sauteed spinach or kale, then pan sear some sweet potatoes on the side. Maybe roasted acorn squash, caramelized brussel sprouts and roasted chicken for dinner? (But try to hold the wine to 1 glass, as alcohol is sacral chakra blocker! This is when you want to exercise moderation.) Maybe roasted salmon with pepitas, roasted asparagus and beet/ carrot pancakes would be a great option. Feel the passion overflow after this meal! Check out some of the recipes, too like spinach and chick pea soup, green smoothie, emerald soup or sweet potato kale bites. You may find yourself flowing with ideas, or getting really cuddly and passionate with your partner. Do you have any meal ideas that include both green and orange foods for more passion in your life? Feel free to share them here in the comments below, or via email.